The general weather situation over Europe changed in February. A dominant high-pressure area particularly influenced the second half of the month. Atlantic low-pressure areas could not prevail and, thus, February 2018 was very sunny with low precipitation and comparatively weak winds. 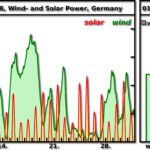 The usual sunshine duration in Germany in February increased by 150% and the usual amount of precipitation by 41%. Stormy gusts, similarly to Bft. 8, were measured only in the low mountain ranges and on the coasts. A special storm event was not recorded. In total, 9,154 GWh of energy was generated by wind and solar farms last February. This is slightly above average compared to the last 39 years. The most profitable February for the total of wind and solar energy was in 2002 with 19,146 GWh* due to high solar energy production. * The UBIMET long-term index compares the solar and wind energy production yields. The UBIMET experts calculate the respective yields for each month of the last 39 years and compare them to the current values. Every yield is related to the current German portfolio so that the periods can be compared. 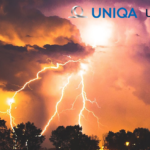 UBIMET is a leading commercial provider of precise meteorology services and severe weather warnings and the first global digital weather service provider. The global company is headquartered in Vienna, Austria and has offices in Karlsruhe, Melbourne, Munich, New York and Zurich employing 250 staff from 25 nations. UBIMET provides high-quality meteorological data, forecasts and alerts enabling weather-dependent industries around the globe to increase safety and efficiency. UBIMET’s expertise and reliable weather solutions have convinced customers from industries such as aviation and rail, construction, energy, insurance, media as well as event organizers. UBIMET has delivered accurate weather data to Formula 1 teams since 2014. The company was founded as a start-up by Michael Fassnauer and Manfred Spatzierer in 2004. The two founders, driven by a passion for meteorology, are still the driving force behind the company today. Red Bull has been a strategic partner since 2012. Since 2015 the UBIMET Group has had an office in Karlsruhe, Germany.The company was founded as EWC Weather Consult in 1999 and was rebranded to UBIMET in November 2017 and is the competence centre for energy and insurance within the group.